Jana Bardonova . Selected works: "Dream and Phoenix" for piano, quartet for oboe, violin, viola, and cello, "Flowing" for chamber orchestra. Sandra Bergmannova . Musicologist, composer. Studied composition at the Jaroslav Jezek Conservatory in Prague. Orchestral compositions, film music. Iva Bittova . Musician, composer. Chamber works. Sylvie Bodorova . Studied composition with Ctirad Kohoutek. Orchestral, chamber, choral, vocal compositions. Music available on CD. Vera Cermakova [Prague 17.3.1961]. Studied composition with Oldrich Semerak (1986-92). Selected works: Orchestral: Four Fragments for Symphony Orchestra (1993); Chamber: 4 string quartets, Three Bagatelles for saxophone quartet (1996), Metamorphoses for cello and piano (1997), "Prolinani" for flute and organ. Solo instrument: Seven Preludes for guitar (1994), "Still Life with a Clarinet" for clarinet (1996), Elegy for flute (1997), "Contrasts" for clarinet (1997), "Confrontations" for cello (1998, 2003). Piano: Preludes (1991), Fantasy (1993), Caleidoscopes (1996, 2000), Lyrical Fragments (1997). Vocal: 3-part song cycle "Reflections and Meditations" for soprano, tenor and instrumental accompagniment. Vaclava Cernohorska [Ostrava 16.11.1972]. Pianist, composer. Studied composition with Milan Bachorek. Selected works: Sonata for oboe, Rondo for clarinet and piano, Movement for clarinet, violin, cello and piano, "Jazzonata" for flute and piano. Zoja Cernovska . Studied composition with Frantisek Emmert, Petr Eben and Svatopluk Havelka. Selected works: Responsae for organ, strings, and percussion (1990), Sonata for violin and piano, string quartet (1987), "Somnia et Noctium Phantasmata," for flute and organ (1990), "Lamento", for middle voice and string quartet (1989), Madrigals for women's chamber choir (1989), cantata "Staleti popluji ke mne jako vory," for baritone and piano (1991). Music available on CD. Eliska Cilkova , composer, pianist. Studied composition and conducting at the Prague Conservatory, continued her studies in composition at the Academy of Perfoming Arts in Bratislava, Slovakia. Some of her music has been published and is also available on CD. Orchestral and stage music: Etapy (Stages) for Strings, Veta (A Movement) for Orchestra, Genitures for Orchestra; Chamber music: Four Pieces for Violin (clarinet, saxophone) and Piano, The Dialogue, Forever Friends, Coming Back, Latin Mood (published by AMOS EDITIO, Prague 2010), Orfeovo rozhodnutí (Orfeus’ Decision) for Violoncello and Piano, "Vzpominka" (Reminiscence) for Piano Trio, Piano Quintet in C major, Betrayal for 2 trumpets in C, marimba, violin, viola and violoncello; Works for violin, piano, bass, drums (Jazzmaze, I Have Nothing to Lose, Summer Tale); Compositions for piano solo: "Vedomi skutecnosti" (Consciousness of Reality), 13 Movements, "V modrem salonku" (In a Blue Lounge); Vocal and choral music: One Day for voice, piano, bass and drums, "Bershava" for soprano and clarinet in B flat, Air for Soprano and Strings, "Krajina" (Landscape) for voice, 2 violins, viola, piano, "Spi, o divko milovana" (Sleep, Oh Beloved Maiden) for mixed chorus, "Sanctus“ for mixed chorus; Electroacoustic music: Homecoming. Jana Dolezelova Barinkova . Studied composition with Frantisek Emmert and Ivo Medek at the Janacek Academy of Performing Arts in Brno. Her creative output includes vocal and chamber music, music for chamber orchestra, and electroacoustic music. Music available on CD. Marketa Dvorakova . Studied composition with Jan Grossmann and Edvard Schiffauer (Conservatory of Ostrava) and Leos Faltus and Ivo Medek (Janacek Academy of Performing Arts, Brno). Vocal, piano, chamber, orchestral compositions, and an opera. Music available on CD. Miriam Dyrrova [20th cent.]. Pianist, composer. Music for flute, a brass quintet. Michaela Eremiasova . Composer, musicologist. Studied composition at the Jaroslav Jezek Conservatory in Prague and jazz composition at Berklee College of Music, further advancing her studies in composition in a doctoral program at the Eastman School of Music (University of Rochester). Ivana Fitznerova, née Camrdova . Her creative output includes "Die Quartenpoesie" for two guitars, Guitar Trilogy for two guitars, "Awakenings" for Strings, "Three Colours of Rainbow" for trumpet and strings, "Vzyvani casu" for symphony orchestra; jazz music. Dorothea Fleischmannova . Organist, composer. Rachel (Ursula) Fortin . She studied composition at the Prague Academy of Music. Her creative output includes two string quartets, music for solo violoncello, and music for harp. Irena Frankova [20th cent.]. Studied at the Janacek Academy of Performing Arts in Brno. Her creative output includes Partita II for solo flute, Imagination for marimba and vibraphone, and other works. Kveta Fridrichova . Elegy for organ. Marie Gasparovicova [20th cent.]. Orchestral music. Petra Gavlasova . Studied composition with Milan Bachorek, Edvard Schiffauer, and Milan Slavicky at the Prague Academy of Music. Solo instrument, chamber, orchestral, and vocal compositions. Electronics, jazz, music for the stage and screen. Music available on CD. Ester Godovska [20th cent.] Pianist, composer. Chamber music. Veronika Hanakova-Kosikova [20th cent.]. Studied at the Brno Conservatory of Music. Music for mixed choir. A. Hansmandova [20th cent.]. Chamber music. Beata Hlavenkova [20th cent.]. Jazz pianist, composer of jazz music. Marie Holanova [20th cent.] Studied at the Prague Academy of Music. Katerina Horka [20th cent.] Piano works. Radka Houskova née Baudisova . Studied composition with professors Macourek and Dousa. Chamber, piano, and vocal compositions, music for chamber orchestra. Gabriela Hrubisova [20th cent.] Piano music. Stepanka Hrubecka [20th cent.] Studied at the Prague Conservatory. Adriana Janakova . Her creative output includes "Studies" for violoncello, piano trio, clarinet quartet, and "C'est la vie," for clarinet, piano and string quartet. Olga Jezkova [29.2.1956]. Studied composition with Frantisek Kovaricek at the Prague Conservatory. Orchestral, chamber, choral, and vocal compositions. Instructive music. Music available on CD. Zlatica Jurisova [Liptovsky Mikulas 19.12.1968]. Born in Slovakia, Jurisova became a Czech citizen in early 1990s and now lives in Prague. She studied composition at the Prague Conservatory (1990-92) and Prague Academy of Music (with Juraj Filas, 1992-1997). Selected compositions: Piano Sonata, Dialogues for Accordion, Miniatures for oboe, "Thou That Glitter" for flute, oboe, guitar, and violoncello, Three Compositions for flute and violoncello, "Prosba Poutnikova" for piano trio, Saxophone Quartet, Cantata for soprano, flute, and harp, Fantasy Concertante on Solomon's texts for dulcimer, 2 sopranos, 2 narrators, and chamber orchestra, Three Songs for mixed choir, "Cosi 3" for voice and orchestra, "Bezbrehym oceanem spechame k obzoru" for chamber orchestra. Eva Kalavska-Faltusova . Studied composition with Prof. O. Kvech at the Prague Conservatory (1998-2004). Chamber and orchestral compositions, music for electronics. Selected works: Suite "Ludus Naturae" for piano and orchestra, Sinfonietta "Ad Purificandum," "Verbum Patris Hodie" for mixed choir and orchestra, Missa Caliginosa for organ and mixed choir, Ballata for brass instruments, Misterioso for piano solo, "Sea Waves" for tenor and piano, "Atmosphere" for flute and electronics. Martina Kachlova [20th cent.] Studied composition at the Janacek Academy of Performing Arts in Brno. Vendula Kasparkova [20th cent.] Film music. Afrodita Katmeridu [7.4.1956]. Studied composition with Frantisek Emmert, Miloslav Istvan, Alois Pinos, and Zdenek Zouhar at the Janacek Academy of Performing Arts in Brno. Chamber music: Two Miniatures for solo violin (1978), String Quartet No. 1 (1979), No. 2 (1981), No. 3 (1985), No. 4 (1999); Barbaric Dance and Finale for solo violin (1985); Voices of the Past for voice, clarinet, piano, and viola; Rapsody for solo violin (2002). Orchestral music: Impulsioni e meditationi per violino solo e orchestra (1982), Prelude for String Orchestra (1983), Impressions for String Orchestra (1995); Concerto for violin, orchestra, and percussion. Electroacoustic music. Irena Kosikova [20th cent.] Organist, composer. Chamber music. Daniela Kosinova . Organist, pianist, singer, composer. List of works: "Na Kampe" - a sketch for piano (1992), Lamentoso and Toccata for organ (1997), Three Pieces for French Horn Quartet (1997, Thomas Music Publishing, Prague 2005), Small Suite, for clarinet quartet (1997), "Laudes" for clarinet (sax) and organ (2000), "Omnia Vincit Amor" for lower voice and string quartet (2002), collection of jazz songs "Meeting Point" (2009, released on CD). Zdena Kosnarova [20th cent.] Vocal and chamber music. Lenka Kozderkova-Simkova . Flutist (Goelan Duo) who also composes chamber music for her instrument. Studied at the State Conservatory of Ostrava and at the Janacek Academy of Performing Arts in Brno. Compositions for flute and violin (with Lenka Zupkova). Music available on CD. Jitka Kozeluhova [Prague, 19.11.1966]. Studied composition with Ilja Hurnik, Petr Eben, and Svatopluk Havelka at the Prague Academy of Music. Selected compositions: Orchestral: Concertino for Piano and Orchestra (c1990), "Inner Voice", for viola and orchestra (1995), Symphony '2007'. Chamber music: Partita for wind quintet (1986), piano trio, Variations for oboe and piano (c1989), string quartet (1991), trio for flute, cello and piano (1992), Suite for saxophone quartet (1992), "Three Sentences about the Christmas Story", for oboe, clarinet, bassoon and piano (1992-93), "To Angels" for two flutes, two clarinets, piano and string quartet (1996), "Night Reflection" for two violins and cello (1997), "A stale dal a dal zazniva Haleluja" (And hallelujah does not die away) for violoncello and piano; Piano: Sonatina (1986), "Der heimliche Schmerz" - fantasy on a theme from Schubert's Rondo, op. 84 for piano four hands (1994); Vocal: Six Songs on Poems by Emily Dickinson for soprano and piano (1991; publ. by Classical Vocal Reprints), "Aus der Tiefe" for mixed choir, two narrators and organ on the text by Huub Oosterhuis (1994), cantata "Thou That Are Thirsty Come to the Waters" for alto, baritone, cor anglais, piano and percussion (1995), Three Canticles for six women's voices, clarinet, and piano (1998). Ludmila Loubova [20th cent.]. Organist, composer. Music for organ. Michaela Macurova [20th cent.]. Pater noster, for mixed choir. Jirina Maresova [20th cent.]. Organist, composer. Studied at the Prague Conservatory. Compositions for organ. Terezie Martinova [20th cent.]. "Piere de con secration a la Reine de la paix" for solo baritone. Nina Matouskova [20th cent.] Studied composition at the Janacek Academy of Performing Arts in Brno. Chamber music. Hana Matuskova [20th cent.]. "Two Impressions" for flute and percussion. Marketa Mazourova . Percussionist, composer. Her creative output includes music for percussion and incidental music. Tatiana Mikova [20th cent.]. Film music. Eva Mitackova [20th cent.]. Studied composition at the Janacek Conservatory in Ostrava. Compositions: Trio for violin, guitar, and cello, "Trojjmeni" for cemballo, "In a Zoo," for marimba. Beata Moravkova, née Hlavenkova [20th cent.]. Studied composition at the Janacek Conservatory in Ostrava. Her creative output includes a piano trio, sonata for clarinet and piano, "Seul en moment" for piano, guitar, violin and double bass, and "Mosaic" for electric guitar, bass guitar and piano. Jindra Necasova-Nardelli . Studied composition with Jindrich Feld and Vaclav Riedlbauch in Prague. Orchestral, chamber, piano, vocal music. Publisher: Alliance Publications. Lenka Nota, née Foltynova . Composer, musicologist. Studied composition with Jarmila Mazourova and Frantisek Emmert. Since 2005 she has lived and worked in Austria. Her creative output includes piano, chamber, orchestral, vocal and choral compositions, and an opera (on libretto by Olga Sommerova). Music available on CD. Lucie Pachova [20th cent.]. Studied at the Janacek Academy of Performing Arts in Brno. Blanka Pavelkova-Hosova [197?]. Studied at the Prague Academy of Music. Selected works: "Srustani" for chamber orchestra, "Podobenstvi o case" for violin and violoncello, Drama 2 for percussion and narrator, Four Piano Compositions, "Skorapky" for baritone and clarinet. Michaela Plachka [20th cent.]. She studies composition at the Prague Academy of Music. Her creative output includes chamber music and Mass for Chamber Choir. Music available on CD. Ilona Polaskova [20th cent.]. Electroacoustic music. Veronika Prazakova [20th cent.]. Studied composition at the Janacek Conservatory in Ostrava. Katerina Ruzickova-Pinosova . Studied composition in Brno with Jarmila Mazourova, Arnost Parsch, and Svatopluk Havelka. Piano, chamber, vocal, orchestral, electronic compositions. She lives in Germany. Music available on CD. Jolana Saidlova, née Hlochova [2.5.1969]. Studied composition with Svatopluk Havelka at the Prague Academy of Music. Orchestral, chamber, solo instrument, piano compositions, songs, incidental music. Sylva Smejkalova . Studied composition with Jan Grossmann, Milan Bachorek, Marek Kopelent, and Alois Pinos. Orchestral, chamber, and piano music. Electronic music. Incidental music. Pavla Spurna [20th cent.] Three Songs for soprano and guitar. Ruzena Srsnova . "Vinobrani" for flute and violin. Hana Srubarova [20th cent.]. "Nalady a smutky" (Moods and Sorrows) - musical miniatures for soprano and piano. Katerina Straznicka . Studied composition with Arnost Parsch at the Janacek Academy of Performing Arts in Brno. Selected compositions: "Songs of Distant Homeland" for SMAB and flute on Chinese folk poetry; "Exotika z doslechu," for two voices, flute, clarinet, viola and percussion, Duo for oboe and accordion, "Vetvicka jmeli" for mixed chorus, "Study" for three percussion players, Three Movements for flute, "Alla motto perpetuo" for violin, cello and piano. Lenka Sturalova [20th cent.] Studied composition at the Janacek Academy of Performing Arts in Brno. Concertino for oboe and strings, songs. Irena Tokarzova-Szurmanova [197?] Her creative output includes Piano Etude, Four Inventions for Piano, "Zablesky zevnitr" for cello and piano, Trio for clarinet, violin, and piano, Septet pro flute, oboe, bass clarinet, violin, viola, violoncello and piano, "Rocks and Stones" for trumpet, percussion and piano, "Ctyri vety na Izaiase" for soprano, piano, and strings, and "Women" - a melodrama on text of Lech Nierostek. Hana Vejvodova [11.7.1963-1.8.1994]. Composer, pianist. A major talent whose life was tragically cut short at 31. Studied piano performance with Jaromir Kriz and composition with Ilja Hurnik, Svatopluk Havelka, and Prof. Donatoni. Her catalogue comprises 40 compositions which include 17 piano compositions and 5 orchestral works, among others. Orchestral compositions: Serenade for Strings, Passacaglia for Symphony Orchestra (1986), 'Deliranda' and 'Arkanum' - symphonic movements (1988-89; 1991-92), Concerto for Piano and Chamber Orchestra (1992-93). Chamber compositions: Suite for Three Clarinets in B-flat (1985), Duets for flute and violin, Wind Quartet, Elegy for violin and organ, Trio for Two flutes and Piano, Brass Quintet (1988), Suite for oboe and piano, Sonata for oboe and piano (1991); Piano compositions: Five Piano Sketches, Etude, Sonatina No. 1, 2, 3, Sonata in C (1984), Sonata for four hands (1985), Partita Bizzara, Sonata No. 2 "Confession" (1988-90), Ten Miniatures, Eight Bagatelles (1993), Sonata No. 3 "Tribute to Nature" (1993-94), Short Stories, Sonata No. 4 "Fate" (1994). Vocal music: Song of the Slain Lover, Chants about the Death of an Empire, for mixed choir (1988), Fairy-tale for mixed choir, Cycle of Three Love Songs, Pathways of Love for higher voice and piano; Music for children: Bouquet of Flowers (cycle of five songs for the youngest children), Watercolour Paintings (seven miniatures for piano, published in 1988 by Editio Supraphon), Animals' Ball (piano suite). Music available on CD. Monika Vejvodova [Prague 13.5.1975]. Studied composition with Bohuslav Rehor, Ivana Loudova, and Juraj Filas. Composer of classical, jazz, and popular music. Classical music compositions: Dreamy Suite for Piano, Miniatures for Flute, Melancholy Duets for viola and cello, Dialogo per Tre for string trio, Romance for Chamber Orchestra, and Cantata about the Birth of Virgin Mary. Lucie Vitaskova . Chamber, orchestral, vocal music. Lucie Vitkova [20th cent.] Studied at the Janacek Academy of Performing Arts in Brno. Unetane tojkef for soprano, string quartet, and chamber string orchestra. Marcela Vocilkova-Trtkova . Studied composition with Leos Faltus at the Janacek Academy of Performing Arts in Brno (1992-98). List of works: "About Myself" for soprano and cello on text by Leonard Cohen (1994), "Per oboe, due clarinetti et fagotto" (1996), flute quartet (1995), "Piano Bit(e)s" for piano, "Cimmar" for dulcimer and marimba (1994), Two Psalms for mixed chorus (1997), Two Pieces, for four brass instruments (1995), "Conflicts," for large orchestra (1997), "Meditation on Creation" for flute, clarinet, viola, cello and double bass (1999), Duo for piano and dulcimer (2001). Jana Vörösova . Studied composition at the Prague Conservatory, the Prague Academy of Music (HAMU), and at the Koninklijk Conservatoire in Brussels. Chamber music. Lenka Zalcikova [20th cent.]. Toccata and Adagio in C Minor for chamber ensemble, "Songs from Sion" for mixed choir, and other works. Terezie Zemanova [20th cent.]. Studied composition at the Janacek Academy of Performing Arts in Brno. Chamber and vocal compositions. Leona Zezulova [20th cent.] Three Compositions for solo trombone. Lenka Zupkova . Violinist (Goelan Duo) who also composes chamber music for her instrument. Studied at the State Conservatory of Ostrava and at the Janacek Academy of Music. Compositions for flute and violin (with Lenka Kozderkova-Simkova). Music available on CD. Search this database to find some of the scores by the above women composers. Bednarova, Vera. Ceske hudebni skladatelky. Bibliograficky letak. Brno: Universitni knihovna, 1957. Cernusak, Gracian and Bohumir Stedron. Ceskoslovensky hudebni slovnik osob a instituci. Praha: HV, 1963. Chmelova, Vera. "Ceske hudebni skladatelky." Undergraduate thesis. Teplice: Konzervator Teplice, 2000. Cohen, Aaron. International Encyclopedia of Women Composers. New York: Books and Music, 1987. Czech Music Information Centre, Prague 1997, 1999. Resource materials on the following composers: Josefina Brdlikova, Sylvie Bodorova, Vera Cermakova, Vaclava Cernohorska, Zoja Cernovska, Milada Cervenkova, Jolana Hlochova-Saidlova, Irena Hodkova, Radka Houskova, Olga Jezkova, Marta Jirackova, Vitezslava Kapralova, Jitka Kozeluhova, Ivana Loudova, Florentina Malla, Jirina Maresova, Jarmila Mazourova, Geraldine Thomsen-Muchova, Jindra Necasova, Jana Obrovska, Elena Petrova, Jana Skarecky, Vlasta Smejkalova, Hana Vejvodova, Monika Vejvodova, and Slava Vorlova. Emmy Destinn. Online project of the Kapralova Society and Dr. Jan Kralik. 1999-2001. contains a biography and complete bibliography and discography of Emmy Destinn. Fukac, Jiri. "Agnes Tyrrellova - zapomenuty zjev moravske romantiky". Opus Musicum, 3, nos. 9-10 (1971): 269-278. Gardavsky, Cenek, ed. Contemporary Czechoslovak Composers. Prague: Panton, 1965. Harvat, Marie J. 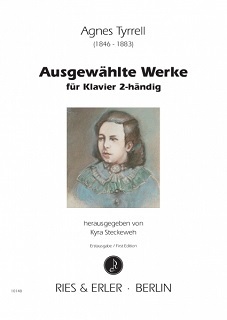 Women Composers' Materials: The Collection of the Czech Music Information Centre. [Scores and sound material.] Prague 2001. Hixon, Don L. and D. A. Hennessee. Women in Music. New Jersey: The Scarecrow Press, 1993. Holeckova-Heidenreichova, Jelena. "Za Julii Reisserovou." Zenska narodni rada (1938): 60-63. Katalog [Chamber music]. Prague: Czech Music Fund, 1974. Katalog [Orchestral music, melodrama, choruses]. Prague: Czech Music Fund, 1978. Klima, Stanislav. "Ceske hudebnice minulosti." Hudebni rozhledy, 6 (1995): 31-33. Klima, Stanislav. "Katerina Veronika Anna Dusikova." Zpravy Bertramky (1961): 14-15. Klima, Stanislav. "Ceska hudebnice Tekla Podleska." Hudebni veda, 17, no. 4 (1980): 340-345. Kratochvilova, Marie. "Samy sobe." Informatorium, Zpravodaj AMU 3 (2004): 4-5. Nabidka hudebnin: rok 2000. Prague: Panton International, 2000. Novakova, Tereza. Slavin zen ceskych. Praha: Libuse, 1891. Prazak, Albert. Josefina Brdlikova Praha: Vilimek, 1940. Sadie, J.A. and R.Samuel, eds. The New Grove Dictionary of Women Composers. London: Macmillan, 1994. Schulmeisterova, Martina. Agnes Tyrrell (1846 - 1883). Dissertation in progress. Janacek Academy of Performing Arts, Faculty of Music, Brno, 2009. Serych, Anna. "Ema Destinnova Florentine Malle." Opus Musicum, 20, no. 10 (1988): I-IX. Serych, Anna. "Konfese Jarmily Mazourove". Opus Musicum, 20, no. 8 (1988): I-III. Serych, Anna. "Konfese Eleny Petrove." Opus Musicum, 18, no. 8 (1986): 239-241. Serych, Anna. "Konfese Jitky Snizkove." Opus Musicum, 16, no. 10 (1984): 315-317. Serych, Anna. "Po preslici." Opus Musicum, 20, no. 2 (1988): 61-64, XVII. Serych, Anna. Zeny skladatelky. Collection of 12 essays. Brno, 1986. Available from Czech Music Information Centre. "Talent je i rodu zenskeho". Vecerni Praha, August 24, 1990.
. Urbanova, Vera. "Anezka Schulzova. K 70. vyroci jejiho narozeni." Zenska narodni rada (1938): 70-72, 106-108, 137-138. Vackova, Jirina. "Ceske skladatelky." Svet mladych zen, no. 4 (1946-47): 45-46. Vackova, Jirina. "Ceske skladatelky." Svet mladych zen, no. 5 (1946-47): 67-70. Vackova, Jirina. "Dilo Julie Reisserove." Zenska narodni rada (1940): 90-92. Vackova, Jirina. Julie Reisserova. Osobnost a dilo. Praha: A.J. Bohac, 1948. Vackova, Jirina. "O, bozske umeni, dekuji ti!" K vyroci Julie Reisserove. Lidove noviny, October 9, 1993, p. VII. Vejvodova, Zdenka. "Z klavirni tvorby Hanky Vejvodove." CD liner. Fermata, 2007. Visek, Tomas. Ceska klavirni etuda. Aspirantska prace (postgraduate paper). Prague: AMU, 1993. Vojackova-Wetche, Ludmila. "Anton Dvorak in the Class Room." The Etude (March 1919): 135-36. Vojtiskova, Lenka. "Eliza Slikova." Casopis narodniho muzea, no. 1 (1959). Vojtiskova, Lenka. "Juliana Reichardtova-Bendova." Zpravy Bertramky, no. 36 (1963?). Vojtiskova, Lenka. "Katerina Cibbini-Kozeluhova." Zpravy Bertramky, no. 29 (1961): 3-8. Vojtiskova, Lenka. "Katerina Emingerova." Casopis narodniho muzea (1956): 1-7. Vojtiskova, Lenka. "Sedmdesat let skladatelky Stankove." Hudebni rozhledy 2 (1958): 83. Vojtiskova, Lenka. "Skladby zen z hudebnich a hereckych novin." Casopis narodniho muzea, no. 1 (1954): 66-73. Vorlova, Slava. "Konfese Slavy Vorlove." Opus Musicum, 5, nos. 5-6 (1973): 155-161. Zavada, Vilém. "Skladatelka Julie Reisserová o sobe." Rozpravy Aventina, 7, no. 6 (1931-32): 44-45. "Ziji mezi nami - vime o nich? Mgr. Zlatica Jurisova. In Hornopocernicky zpravodaj, no. 5 (2002): 6-7. (27 January 2006) http://www.pocernice.cz/zpravodaj/HPZ5-02/obsah%20hpz502.htm Zezulova, Hana. "Ceske skladatelky na klavirnich oddelenich - vyzkum mezi uciteli a zaky ZUS." Bachelor thesis. Faculty of Pedagogy, Masaryk University in Brno, 2015. Database by © 1999-2018 Karla Hartl is a part of the Kapralova Society internet project dedicated to women in music.